At Papale Eye Center in Springfield, MA, we rely on the latest innovations in lens implant technology, intraocular lenses (IOLs), to help reduce or completely eliminate the need for glasses for our cataract and nearsighted patients. IOLs are implantable lenses that restore a patient’s vision by either replacing the natural lens (during cataract surgery), or by inserting an artificial lens in front of the natural lens (to correct nearsightedness). 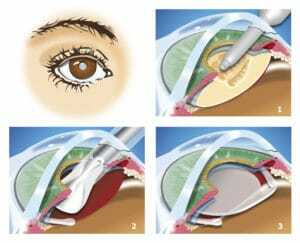 Cataract removal surgery has been one of the most commonly performed eye surgeries in recent years. Due to continual advancement in technology and products, we have witnessed substantial improvement in patient outcomes since the early days of cataract treatment. 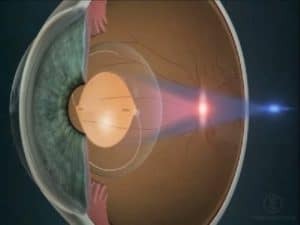 The purpose of cataract surgery is to remove the clouded lens and restore optimal vision by replacing the natural lens with a man-made structure. This is referred to as an IOL, or intraocular lens. Initially, replacement lenses did little more than restore clarity. More recently, we have experienced advances that allow us to also minimize or eliminate patients’ need for eyeglasses. This is achieved by the appropriate selection of IOL. What is the Tecnis Symfony IOL? Historically, cataract patients have selected an appropriate IOL from one of two categories: monofocal or multifocal. The Tecnis Symfony IOL is part of new-generation replacement lenses, one that does not involve distinct focal points. Instead, this type of intraocular lens elongates the focus of the eye to accommodate all distances. What is the difference between multifocal IOLs and traditional IOLs? A traditional intraocular lens, or monofocal lens, is inserted in place of the eye’s natural lens that has been clouded by cataracts. This type of IOL has a singular point of focus, which is determined by the eye surgeon based on vision data obtained prior to surgery. After cataract surgery and the placement of a monofocal IOL, distance vision should be very clear without the need for eyeglasses. Patients may still require the use of reading glasses to optimize near vision. Multifocal lenses were developed with the intent of eliminating or greatly reducing the need for corrective eyeglasses after cataract surgery. The multifocal IOL disperses light that enters the front of the eye onto two distinct points, also set by the ophthalmologist. These two points may be distance and intermediate or distance and near. While the multifocal lens may offer more benefits than a monofocal IOL, limitations have been noticed. Some patients may continue to need eyeglasses at certain times. Halos and glares may also be noticed at night. It is important to note that the Tecnis Symfony IOL differs from both the monofocal lens and the multifocal lens. This IOL has no points of focus and therefore is less likely to cause halos and glares. The elongated focus of the Symfony IOL supports a continuous flow of sharpness and clarity from near through intermediate and to distance vision. This continuum is advantageous due to the much lower instance of blurriness between two distinct points (if any). According to clinical studies, approximately 85% of patients treated with the Tecnis Symfony IOL no longer rely on eyeglasses for clear vision at any distance. What is the procedure of cataract surgery with the symphony IOL? Cataract surgery is a standard, precision procedure that follows the same basic steps regardless of the type of IOL that is selected for lens replacement. The procedure is one of the safest and most effective ways to correct cloudiness due to cataracts and is conducted millions of times every year. Cataract surgery is an outpatient procedure that is conducted after the eyes have been numbed with medicated drops. Ultrasound technology is incorporated into our surgical process, which supports the disintegration of the clouded lens through a tiny incision, and eliminates the need for stitching of that incision. 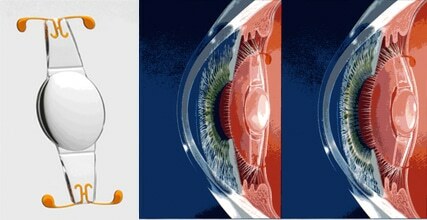 Once the clouded lens has been fully removed, it is replaced with the replacement lens. This new lens naturally adheres to the eye, and the incision heals quickly to support the new lens. What is the recovery after surgery? One of the benefits of cataract surgery is that very little downtime is needed. Patients should arrange reliable transportation to and from the office. At home, rest is all that is needed to help the eye recover. A protective shield may have been placed over the eye after surgery. Our staff will provide guidance on when the shield may be removed and when, if at all, it should be worn. There should be little, if any, discomfort to speak of after cataract surgery. Most patients report relatively clear vision within the same day after their procedure, though it is also not uncommon for waves or blurriness to linger for a few days. What are the risks of surgery with Tecnis Symfony IOL? The primary risk associated with cataract removal is an infection, which is inhibited by antibiotics. Learn more about how you can get clearer vision with cataract surgery and the Tecnis Symfony IOL. Call our Springfield, MA office at (413) 782-0030. What is the ReSTOR® lens? The ReSTOR® lens is an artificial lens implant that is designed to replace the natural lens of the eye. Made of a soft, flexible plastic material, the ReSTOR® lens has a patented design that allows it to focus light on the retina for clear vision at near, far, and intermediate distances. In just a few hours, the ReSTOR® lens can be inserted in the eye, then quickly and easily unfolded to restore vision during a brief visit to our Springfield, Massachusetts office. The result is a remarkable improvement in both the quality (sharp, clear images at all distances) and quantity (a full range) of vision. Who is a candidate for ReSTOR® lens implants? The ReSTOR® lens is FDA approved for the treatment of cataracts. ReSTOR® lens implants are available at our Springfield, Massachusetts eye center to all patients with cataracts and/or presbyopia (difficulty with close-up vision). The ideal candidate for the ReSTOR® lens is someone who is seeking better vision at all distances – near, far, and intermediate – without the hassle of glasses or contact lenses. How does the ReSTOR® lens treat presbyopia? Patients in their 40s who have trouble with close-up reading are generally experiencing the first effects of presbyopia. Presbyopia is essentially a problem with the lens of the eye. As the lens hardens and becomes inflexible with age, it becomes more and more difficult to focus on nearby objects for reading and other activities. By replacing the hardened lenses with flexible lens implants like ReSTOR®, the eye surgeons at our practice can almost completely restore vision affected by presbyopia. What results can I expect after ReSTOR® lens implant surgery? In a clinical study, approximately 80 percent of patients who received the ReSTOR® lens indicated that after surgery, they never had to wear glasses again! With the ReSTOR® lens, most patients can read the newspaper, play sports, and drive their cars (even at night) without glasses or contact lenses. In practical terms, the ReSTOR® lensdecreases or completely eliminates dependence on prescription lenses. Patients suffering from cataracts and/or presbyopia are typically very satisfied with the ReSTOR® lens. In fact, more than 90 percent have indicated they would choose ReSTOR® lens implants again if given the choice! At our practice, we recommend the ReSTOR® lens because we are confident in the results. To find out what ReSTOR® lens implants can do for you, contact Papale Eye Center in Springfield, Massachusetts today. Crystalens® Accommodating IOLs “ﬂex” or “accommodate” like your natural lens to deliver a continuous range of vision at near, intermediate and distance in all lighting conditions. Crystalens® has ﬂexible hinges that allow it to move with your eye. Unlike standard IOLs, Crystalens® is designed to treat both cataracts and presbyopia. Crystalens® can even reduce or eliminate your need for glasses during most activities. How is Crystalens® different from a standard IOL? Standard IOLs used in cataract surgery are designed to only treat cataracts, so you will probably still need glasses for many daily tasks, especially computer and reading up close. Crystalens® is designed to correct more then just your cataracts. Crystalens® can offer a more natural range of vision then a standard IOL, and in many cases reduce your dependence on glasses. Will I really be able to see without glasses? If you are like many Crystalens® patients, you should experience improved vision at all distances, with minimal or no dependence on glasses after Crystalens® surgery. Since everyone’s vision, expectations and lifestyles differ, it is difﬁcult to determine how much you will be dependent on glasses. Who is a candidate for Crystalens® lens implants? Only your doctor can determine if Crystalens® is right for you. To ﬁnd out if you’re a Crystalens® candidate, Dr. Papale will perform a thorough exam. You may be a candidate even if you had prior eye surgery. The TORIC IOL is a lens implant designed for cataract patients who suffer from astigmatism. Many of our cataract patients have required glasses or contact lenses to drive or read for much of their adult lives. With TORIC IOLs, we can help restore can restore sharper distance vision to these patients. How does this lens implant work? When the eye’s natural lens (cataract) is removed and replaced with a TORIC IOL, imperfections in the eye’s shape are improved. This means clearer vision without the need for multiple incisions, as is common in other astigmatism surgeries. If you use TORIC contact lenses to reduce or correct astigmatism, the TORIC IOL will work using the same principles. Am I good Candidate for the TORIC IOL? If you are undergoing cataract surgery, and have suffered from astigmatism, the TORIC IOL can be a great lens implant option for you. Speak with your doctor to discuss your specific condition. Will I need multiple surgeries? No, TORIC IOLs are placed in the patient’s eye during routine cataract surgery just as the other intraocular lenses used at Papale Eye Center. In addition, recovery time is shorter and more comfortable than with older methods of addressing astigmatism. If you are interested in learning more about lens implants, including the ReSTOR® lens, TORIC lens, and ICL contact our Springfield, Massachusetts eye surgery center. Our experienced doctors can help restore your vision so you can enjoy freedom from glasses and contact lenses. At your evaluation appointment, our doctors will discuss your visual goals with you and help you select a lens implant that suits your needs. For more information about our lens implant options in Springfield, Chicopee, Agawam, Longmeadow, Ludlow, and Westfield, MA, please call our Springfield office at (413) 782-0030.